FINALLY! OUR LONG VERSION OF OUR GOGO GEAR KEVLAR LEGGINGS IS AVAILABLE! SIZES 6 - 18 (SEE SIZE CHART BELOW). IF YOU ARE 5' 8" (172.75CM) OR TALLER, PLEASE ORDER THIS LONG VERSION! NOTE: The Tall leggings are a complete different product from our regular leggings. 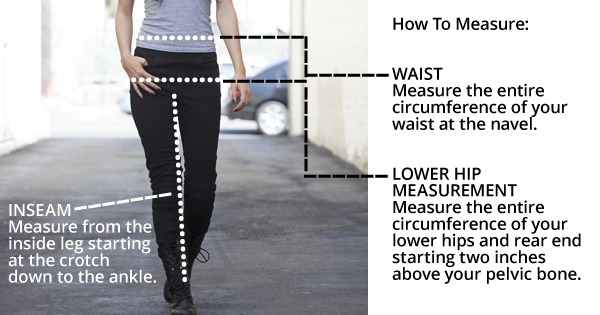 The new, taller leggings are straight and narrow, as opposed to the "jeggings" fit of our regular leggings. Please do NOT use the size chart for our regular leggings to order this item." See measurement chart below for this product. IF THE SIZE YOU ARE TRYING TO ORDER IS OUT OF STOCK, PLEASE EMAIL desireeE@scooter-girls.com and indicate what size you would like to back order. WE WELCOME OUR UK AND EUROPEAN BASED CUSTOMERS! WE SHIP FROM OUR WAREHOUSE IN NORTHAMPTON UK SO DELIVERY TIMES ARE USUALLY JUST A FEW DAYS! Hi everyone! Arlene from GoGo Gear here, as promised, the woman who crashed on the track in our GoGo Gear Leggings (aka Trousers) sent the video of the crash and what happened after. Here it is: https://youtu.be/ZLwMcNeNzOg We at GoGo Gear have NEVER EVER suggested that the leggings/trousers were for use on the track, but this rider chose to wear them anyways... the rider is from Northern California and the track she was riding on requires a one or two piece suit zipped together. She indicated that the jacket and pants were not zipped, but the track didn't know it. She knows she made a bad decision but in the end, the GoGo Gear Kevlar Leggings, made of two entire layers of abrasion resistant fabric (way more than Kevlar Jeans) did the job of protecting her legs. See for yourself. If you have ANY questions about sizing or aren't sure, please email desireeE@scooter-girls.com so we can be sure we send you the size that makes the most sense for you! NOTE: We want to be clear that we are VERY serious about the need for our customers to measure themselves before ordering. Our new exchange policy is as follows: GoGo Gear pays discounted shipping on the initial purchase. All exchanges and returns are the responsibility of the customer. PLEASE SELECT YOUR SIZE CAREFULLY. If in doubt, just email us at: desireeE@scooter-girls.com. It is our pleasure to assist you in selecting the best fit. Great fit! Wear these like regular jeans. Feel so much safer now while riding. Can wait to get another pair. After measuring I ordered a 6T but ended up returning for 8T. I usually wear size 8L but after measuring I thought the 6T would fit. Should have kept to my regular size 8L. Anyway, the return/exchange process was very smooth. These are WORTH EVERY PENNY. Buy them and be safe.